Complex product designed to improve the properties of diesel fuel and to flush the engine fuel system. It quickly cleans the fuel system from all types of sediments and contaminations. It protects injector valves from burning and clogging up with tarry sediments. The Diesel-Lux Winter (for winter season) significantly depresses the chilling temperature of diesel fuel and prevents formation of paraffin crystals. Cleans the fuel system from carbon, tarry, and vanish deposits; protects it from wear and corrosion. Improves process of fuel combustion. Protects fuel system from wear and corrosion. Decreases the level of toxic exhausts. Squeeze out the content of the tube into a fuel tank before refueling. Compatible with all types of fuel. 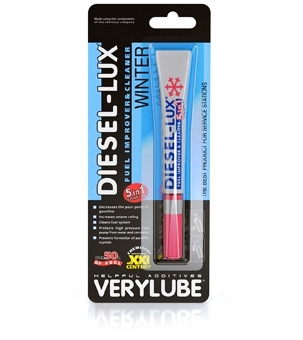 Diesel-lux Winter is introduced when warmed up to the temperature of 20...25 °С into non-thickened (transparent) diesel fuel. To make the application easy, squeeze the content of the tube into the refueling nozzle before filling.